In each of his novels Ian McEwan has brilliantly drawn his reader into the intimate lives and situations of his characters. But never before has he worked with so large a canvas: In Atonement he takes the reader from a manor house in England in 1935 to the retreat from Dunkirk in 1941; from the London’s World War II military hospitals to a reunion of the Tallis clan in 1999. 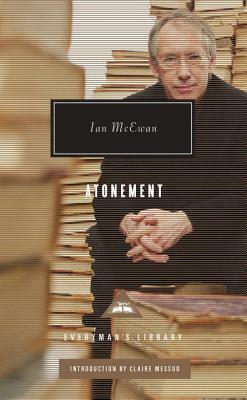 Atonement is Ian McEwan’s finest achievement. Brilliant and utterly enthralling in its depiction of childhood, love and war, England and class, the novel is at its center a profound–and profoundly moving–exploration of shame and forgiveness and the difficulty of absolution. Ian McEwan is the bestselling author of more than ten books, including the novels The Comfort of Strangers and Black Dogs, both shortlisted for the Booker Prize, Amsterdam, winner of the Booker Prize, and The Child in Time, winner of the Whitbread Award, as well as the story collections First Love, Last Rites, winner of the Somerset Maugham Award, and In Between the Sheets. He has also written screenplays, plays, television scripts, a children’s book, and the libretto for an oratorio. He lives in London.